Why Choose RPA Inc.? – RPA Inc.
Search Process Diversity Why Choose RPA Inc.? With our experienced consultants, tailored search services, and values-centered approach, RPA Inc. creates a seamlessly efficient and effective recruitment process. RPA Inc. is comprised of individuals who are experts in executive recruitment. Our consultants have a comprehensive knowledge of higher education. Therefore, we are not limited to one particular focus (such as only presidential, dean-level, or student affairs searches). We have experience in all aspects of the higher education sector. This also allows RPA Inc. to take on more complicated searches for positions that aren’t as easily filled. RPA Inc. offers several different levels of search services. With these cost-effective options, you are able to choose the service that meets your needs as well as your budget. Then, recruitment materials, candidate evaluation instruments, and other tailored tools and procedures are created based on the information gathered during the assessment. A full, nationwide outreach is performed to develop a unique pool of candidates for every position. This outreach includes cultivating prospective candidates and eliciting nominations. RPA Inc. actively pursues qualified professionals, advocating our client’s opportunity. In addition to the networking capabilities of our search team, every search is strengthened by targeted research and an increasingly growing proprietary database of professionals. With over 200,000 profiles, our database proves invaluable in developing large, robust, and diverse applicant pools. RPA Inc. is highly responsive to the evolving needs of our clients. Because we limit the number of projects our consultants work on at a given time, one client’s needs do not supersede another’s. RPA Inc. also assigns an internal search manager as liaison for each search, ensuring that responses to any client inquiry regarding the search progress are made as soon as possible. This allows RPA Inc. to provide multiple clients with extremely intensive services, and make each institution we serve feel like our only client. Each search begins with an on-site assessment during which we gather information and research the institution to identify the qualities and characteristics your next team member must possess. Based on the needs of the client, RPA Inc.’s unique process identifies candidates that aren’t just the most qualified, but also the strongest fit for your organization. RPA Inc. provides advisement that enriches the institution’s understanding of the skills and qualities each candidate brings to the table and ensures that all candidates are evaluated in an objective manner. Our facilitation of the candidate screening process puts all decision-making authority in our clients’ hands.This process assures that the final choice of the top candidate is not influenced by factors other than the needs of the organization. Our services do not end until your choice candidate has been on the job and fully integrated into your institutional culture. RPA Inc. continues to consult with you as you develop your relationship with your top candidate. We will continue to consult with you, if necessary, three times during the first year, to ensure the success of your new leader. This consultation will provide advisement and counsel during the crucial transitional period. We prioritize fostering a positive candidate experience. We want every candidate to come away from the search feeling good about the client institution. We aim to maintain and enhance the institution’s strong reputation through our engagement with candidates. 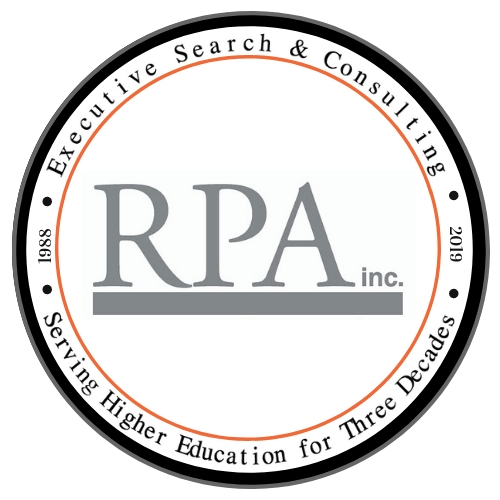 By creating this positive relationship with candidates, we also gain their trust and respect, making them more willing to apply for future searches with RPA Inc.
RPA Inc. is one of the preeminent executive recruitment and consulting firms for higher education institutions and nonprofit organizations. Founded in 1988, RPA Inc. was formed to empower institutions and organizations working for the greater good to obtain the personnel and resources necessary to achieve their goals.